Equestria™ HorseShoe™ 8-piece Deluxe Grooming Kits are fun and ready to get to work for you. 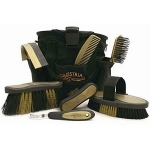 They include: body brush, flick brush, face brush, hoof pick, mane comb, mane and tail brush, sweat scraper and matching 6 pocket nylon tote. Tote can be closed with a built in cord lock to keep tools inside and dust and dirt out! Complete Line of Bickmore Leather Care Products. Contact the store for product availability. Cleans all types of accessories; nylon, leather, cotton, fleece and neoprene. Works great on sweat wrap and blankets. Works on all contaminants; sweat, grease and other organics. Helps stop cross bacterial contamination; ringworm, rein rot and other skin problems. 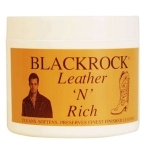 Blackrock cleans, nourishes, and beautifies all leathers (except suede, naked leathers, unfinished leathers, and glazed lambskin) to a rich mellow glow. Use very sparingly, a little goes a long way. 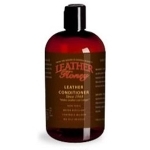 A liquid glycerin-based leather cleaner for cleaning saddles, bridles, boots etc. You can also use it to clean other leather items such as car/truck leather interiors, sofas, motorcycle saddlebags, purses etc. 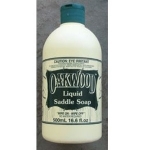 Oakwood Liquid Saddle Soap has been specially formulated with a neutral PH balance. Therefore it is not sticky to the touch, leaves no residue and will not collect dust and dirt like many other leather cleaners. 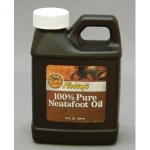 This saddle soap is so unique that you don't use water, thus saving wear and tear on your tack or other leather goods. Simply put a small quantity on a slightly damp cloth or sponge and wipe the dirt away. The Original RidersRasp™ features an ergonomic design that fits all hands, a soft grip with no slip sides to protect hands for the rasps, and rasps that are designed for rounding, not removing hoof wall. 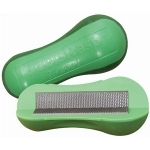 The Original RidersRasp™ uses medium finish files which are great for rounding or beveling the hoof, maintaining hoof form without the risk of removing too much hoof.